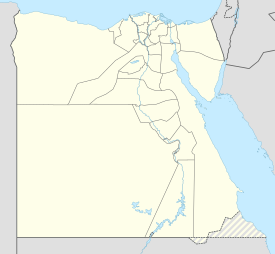 Deversoir Air Base (LG-209) is an active airbase of the Egyptian Air Force, known as 'Abu Sultan', located approximately 19 km south-southeast of Ismailia (Al Isma`iliyah); 116 km northeast of Cairo. It was formerly a major Royal Air Force airfield known as RAF Deversoir built before World War II. A helicopter unit with SA-342 Gazelle helicopters is based here. Deversoir was a Royal Air Force (RAF) military airfield built in the 1930s. It was built part of the defences of the Suez Canal, being constructed at the northwest shore of the Great Bitter Lake. During World War II, it was used as a military airfield by the RAF and the United States Army Air Force during the North African Campaign against Axis forces. The airfield received United States President Franklin D. Roosevelt on 12 February 1945 as he flew from the Yalta Conference to rejoin the USS Quincy, which was anchored in the Great Bitter Lake and would host the President's meetings with King Farouk of Egypt, King Abdulaziz of Saudi Arabia, and Emperor Haile Selassie of Ethiopia before transporting him back to the United States. Deversoir appears to have been used by the RAF after the war until 1956, then turned over to the Egyptian Air Force. Modern hardened aircraft shelters were built on wartime-era dispersal pads, and recent runway markings are evident in aerial photography. The airbase is being used to accommodate a helicopter unit flying SA-324 Gazelle, armed helicopters. Royal Air Force Station Deversoir was operative as 324 Fighter Wing in 1950 when it was the home of three squadrons of DeHaviland Vampire aircraft plus 3 Gloster Meteors, one to each squadron. The squadrons were numbers 6,213 and 249. Some time near the end of WW2 the station had been used to house Italian prisoners of war and this was evidenced by a painting done by one of them which was present in 1950 - 1952 in one of the cookhouse dining room for other ranks. ^ "February 12th, 1945 - FDR: Day by Day". FDR: Day by Day. Retrieved 2018-08-20. ^ a b "RAF Deversoir". Air of Authority - A History of RAF Organisation. Retrieved 30 March 2015.